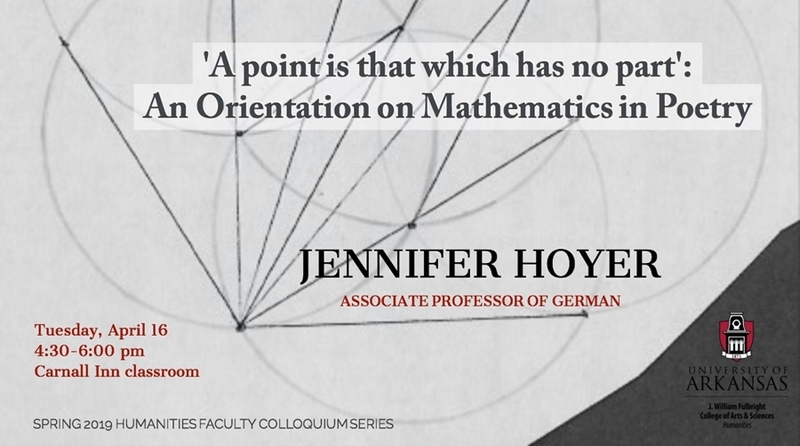 The J. William Fulbright College of Arts and Sciences' Humanities Faculty Colloquium Series presents Jennifer Hoyer, who will discuss her inquiry into math and poetry. The colloquium takes place at 4:30 p.m. Tuesday, April 16, in the Carnall Inn classroom on the University of Arkansas campus. Mathematicians and poets of the same era are pondering similar ideas, similar (or even the same) concepts; and yet, they are often treated as if they are unrelated, or even as if they stand in opposition to one another, and cannot relate. So what do we do with a poet like Nelly Sachs, who writes about orientation using points, lines, curves and shapes? What about a poet like Günter Eich, who views his work as fundamentally trigonometric? In short, what happens to mathematics in the hands of a poet? That is what Hoyer wants to know — but for her to be able to think and talk about that requires pursuing mathematics, which means confronting a long-standing assumption that she is not, and could not be a "math person." What has emerged from this endeavor is a project Hoyer calls "Thinking Inconveniently," which explores intersections of math and poetry, and in so doing compels her to think about how she orients herself in the world; how we regard mathematics and poetry as oppositional; and therefore how we teach and learn both. Hoyer is associate professor of German and director of the U of A's Jewish Studies program. She is the author of "The Space of Words": Exile and Diaspora in the Works of Nelly Sachs (Camden House, 2014), which examines early writings of the known Holocaust poet. The faculty colloquium series highlights compelling humanistic research and invites lively intellectual exchange. The event is free and open to the public. Light hors d'oeuvres will be served. Carnall Inn has free parking and it located at the intersection of Maple and Arkansas Avenue. About the Humanities program: The Humanities Program in the J. William Fulbright College of Arts and Sciences promotes humanistic scholarship and inquiry, innovative and interdisciplinary teaching, and humanities scholarship to the wider community.The mission of the Humanities Program is threefold: to support and advance cross-disciplinary research and inquiry in the humanities; sponsor special programs that engage the university and wider public in conversation on issues that bring the humanities to bear on salient topics of our times, and to foster a strong role for the humanities in an increasingly global society.